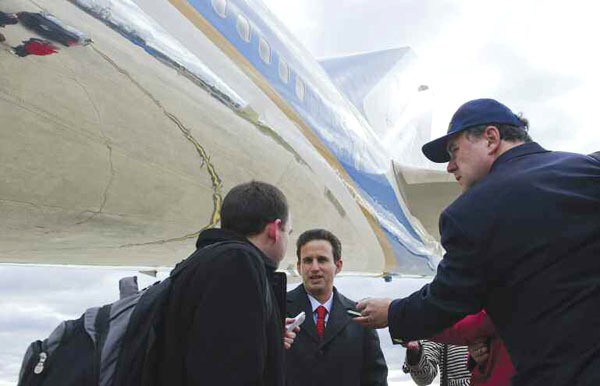 The weight of it finally hit him, Brian Schatz ’94 says, when he woke up from a rest on Air Force One, bound for the nation’s capital, in the early morning of Dec. 27. A day before, Schatz had basked in the warm breezes of Honolulu, where he served as Hawaii’s lieutenant governor, a role with few expectations compared to the one he was about to begin. Now he was pulling out of his slumber, mobilizing himself for a private chat with President Barack Obama. He was flying to Washington, D.C., to be sworn in as the youngest of 100 senators, arriving just as Congress was in an acrimonious fight over how to keep the nation from going over the “fiscal cliff” of budget cuts and tax hikes. Less than 24 hours earlier, the governor of Hawaii had called Schatz into his office and informed him that he would be appointed to fill the seat of Sen. Daniel K. Inouye, who had died Dec. 17 at the age of 88. The appointment of Schatz (pronounced “shots”) had been something of a surprise. In the last days of his life, Inouye, a revered figure who had represented Hawaii in Congress since it became a state in 1959, wrote a note to the governor asking that his protégé, Rep. Colleen Hanabusa, succeed him. But Hawaii law had a procedure to fill the last two years of Inouye’s term, requiring aspirants to apply to a committee that would forward three names to the governor. Schatz, who had flirted with running for Hawaii’s other Senate seat last year, applied along with a host of other public figures. Gov. Neil Abercrombie—a friend of Obama’s father in graduate school at the University of Hawaii—had served in Congress for 20 years, and he had his own ideas about what the state needed. Abercrombie knew how important it was for small states to build up seniority, and Hawaii was losing not just Inouye, the longest-serving senator and the chairman of the cornucopia that is the Appropriations Committee, but also Sen. Daniel Akaka, who was retiring after 36 years in Washington. So instead of turning to politicians of his own era, Abercrombie looked to Schatz, who was only 40 and had served four terms in the state legislature before chairing the state party and winning a primary to become Abercrombie’s running mate in 2010. WHEN ABERCROMBIE CALLED HIM into his office in the early afternoon of the day after Christmas, Schatz had an inkling that the news would be good, although he says the men hadn’t talked about the position. After a quick news conference and official paperwork in the state Capitol, Schatz recalls in an interview, he and his family had “the fastest two or three hours of our lives” as Schatz rushed to buy warm clothes for the Washington winter, arrange commercial flights for his parents, his wife and two children, and get everyone to the airport. There was no time to savor the moment. His swearing-in ceremony was set for 2:30 p.m., when Schatz walked hand-in-hand into the Senate chamber with Akaka, trailed by Senate Majority Leader Harry Reid, who was anxious to meet his 53rd Democratic vote. After Vice President Joe Biden administered the oath of office, the entourage re-enacted the ceremony in an adjacent chamber before Schatz’s family and the cameras. Biden played Schatz’s mother, Barbara. “Uncle Joe made me feel really comfortable,” 8-year-old Tyler Schatz told his dad. Schatz hurried back to his new office—a temporary space in a former dining room of a Senate office building, chopped into cubicles punctuated by awkwardly spaced chandeliers—and dove into paperwork. At 5 p.m. he had to hustle back to the Senate floor to vote on a renewal of the law that governs foreign surveillance, which faced civil liberties objections from left and right. SCHATZ CAME TO POMONA in the fall of 1990, shortly after his older brother Jake graduated from there. “I was looking for a high-quality academic experience but I didn’t want to be overwhelmed in crowds. And of course I was looking for someplace warm,” he says. “My goal going into Pomona was to learn how to think through issues,” Schatz recalls. That led him to major in philosophy. He particularly remembers two celebrated professors, Stephen Erickson and Jay Atlas, who gave him a jolt of reality. “Erickson wasn’t afraid to be a little tough on me,” Schatz says. And so, after he graduated, Schatz headed home to Hawaii. He started a nonprofit to get young people involved in community service, engaging in environmental restoration (“planting trees and digging weeds”) and activism. “That was where I found my passion for public service.” Schatz later went on to run Helping Hands Hawaii, a major social service agency. letter of protest against the Tuskegee syphilis study, which since 1932 had been recording symptoms of black men in rural Alabama without treating their syphilis—even though penicillin was well known as an effective treatment. When the existence of the federal study became public in 1972, it was quickly shut down, sparking the development of standards to protect research subjects. Minnesota’s Mayo Clinic recognized Dr. Schatz as a “hero of medicine” in 2009. Still giddy next year or not, Schatz says he may not be able to chirp in person in 2014 at his 20th reunion. After all, he’s up for election that year, and several Hawaii Democrats are eyeing a challenge in the August primary. Brian Schatz ’94 isn’t the first Sagehen sent to Congress in the post-war era. Fellow Democrat Alan Cranston ’36, who attended Pomona for a time but graduated from Stanford, held a California seat for 24 years, ending in 1993. In the House, Republican Charles “Chip” Pashayan Jr. ’63 represented the Fresno area from 1979 to 1991, and Democrat Frank Evans ’45, who attended Pomona for two years before entering the Navy, held a Colorado district from 1965 to 1979.